I have a tutorial for you today. 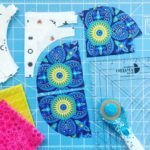 I know that sewing a full circle is super daunting, but I did some tries this week and am here to report you can do it! I have been asked a few times about cutting full circles with the Classic Curves Ruler and I had a great reason to try it this week. I am making a little quilt with new fabric called Tallinn. 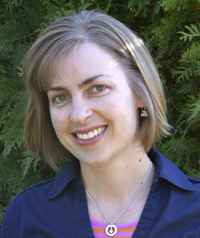 It’s Jessica Swift’s first collection for Art Gallery Fabrics. Since the focus prints have such cute illustrations, I wanted to make something that kept those fabrics rather large and showed off the prints. 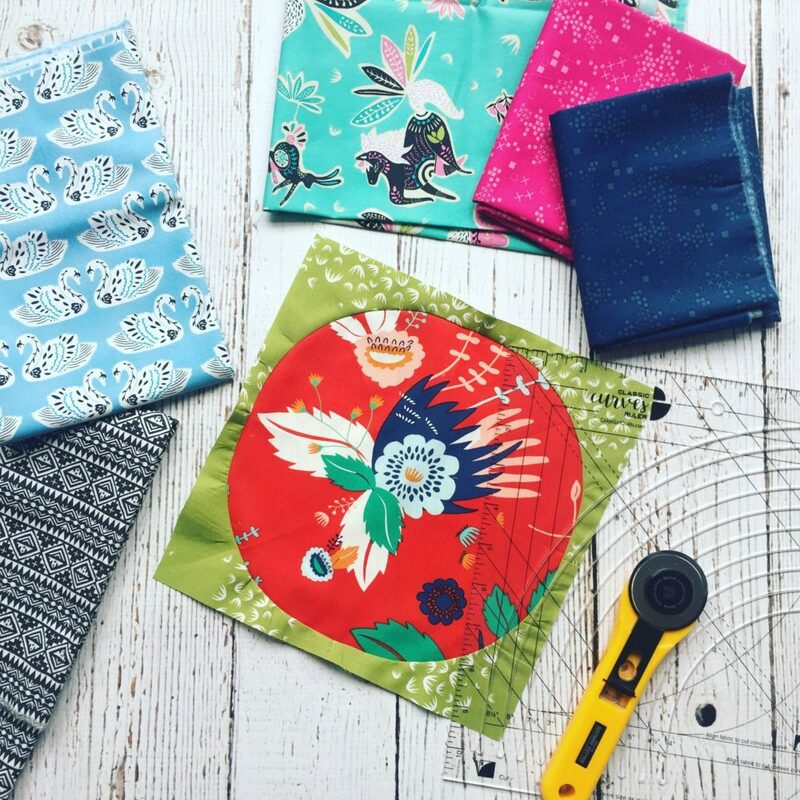 You will need two fabrics, plus your Classic Curves Ruler, pins, iron and sewing machine. 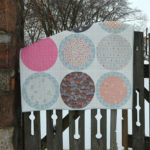 For this example, I am making a block that will finish 9″ with only about 1/4″ of background fabric outside the circle. 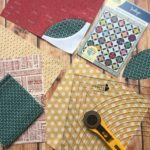 You can adapt this to use any of the ten size options on the Classic Curves Ruler and leave more fabric outside the circle if you want. Fold the background square twice so you are working with it at 1/4 it’s original size. 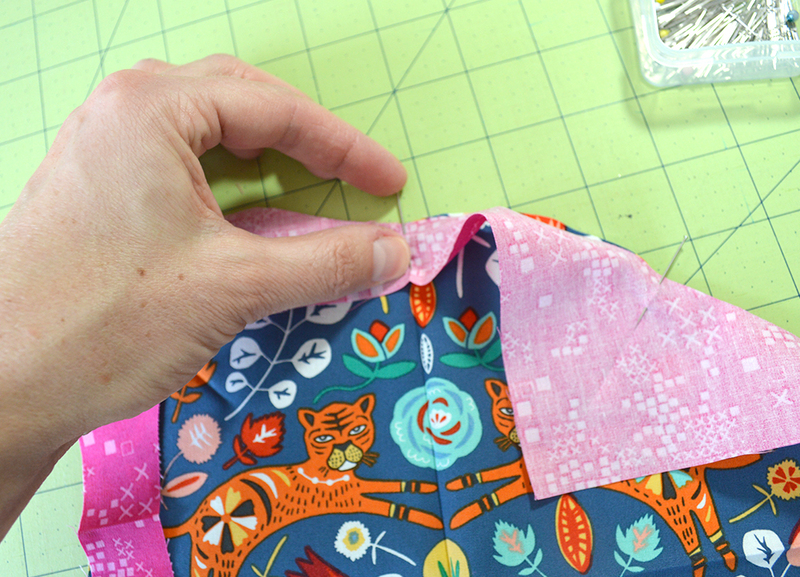 Place the folded square on the cutting surface and place the CCRuler over the fabric. Align the two folded edges of the fabric with the lines on the Ruler for cutting the concave shape. Use the 4 1/2″ groove to cut the curve. You are going to use the piece with the hole in it. The circle piece is a scrap for another project. 4. 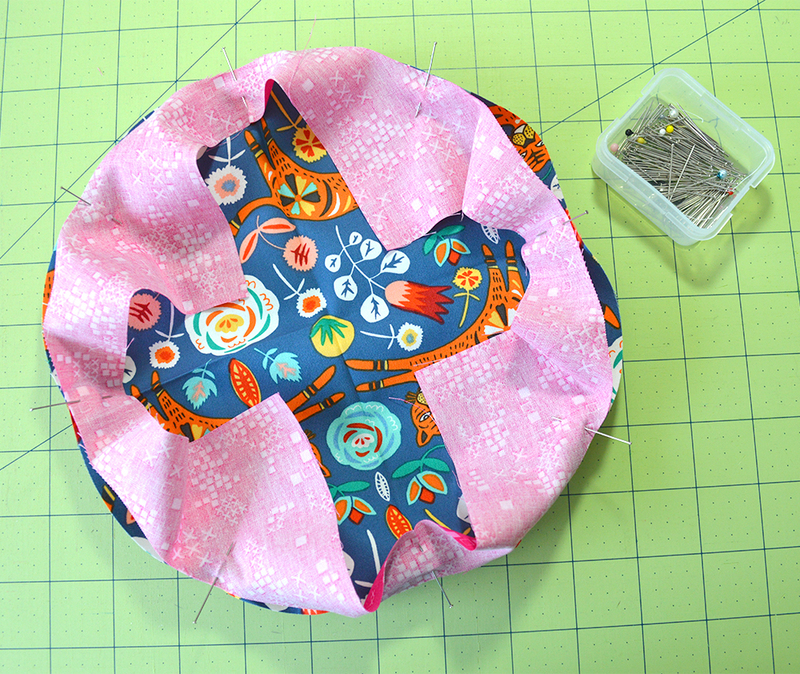 Fold the 9 1/2″ circle fabric twice so you are working with just 1/4 of it, the same as you did for the background fabric. 5. 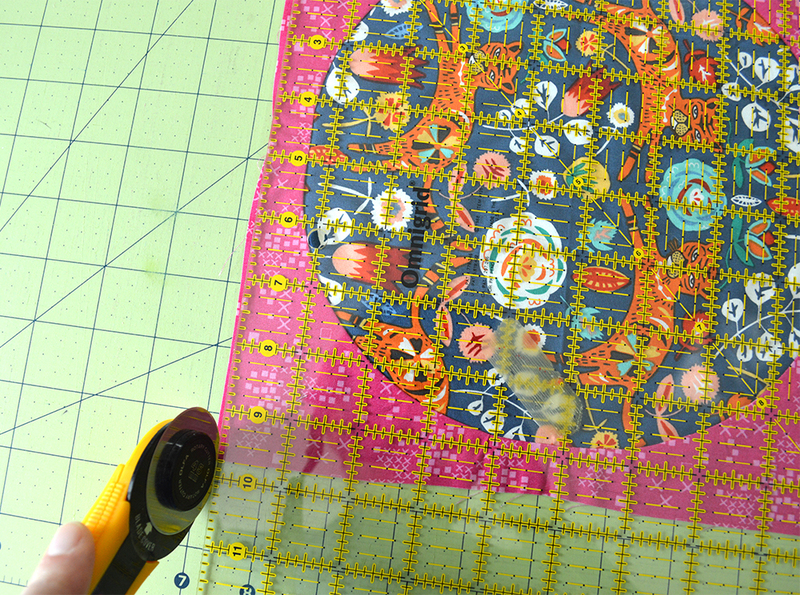 Place the circle fabric on the cutting surface and place the CCRuler over the fabric. 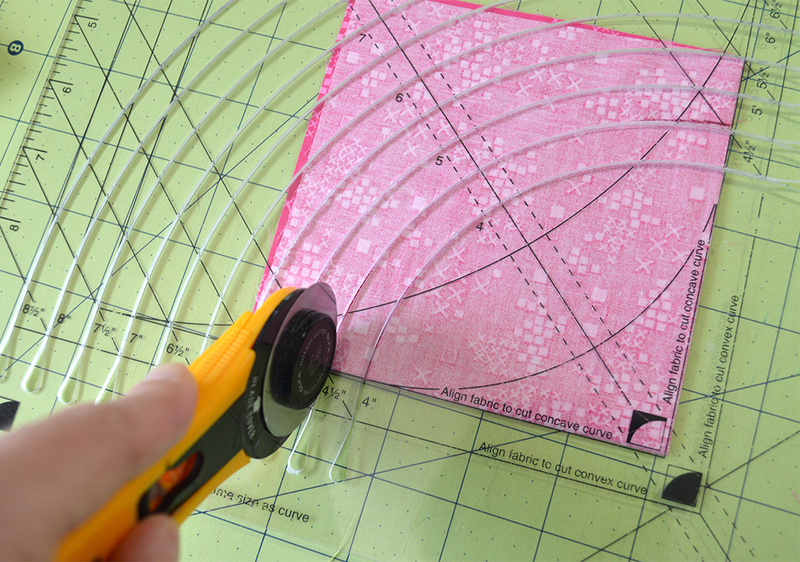 Line the folded edges up with the lines on the Ruler for cutting the convex shape (see below). 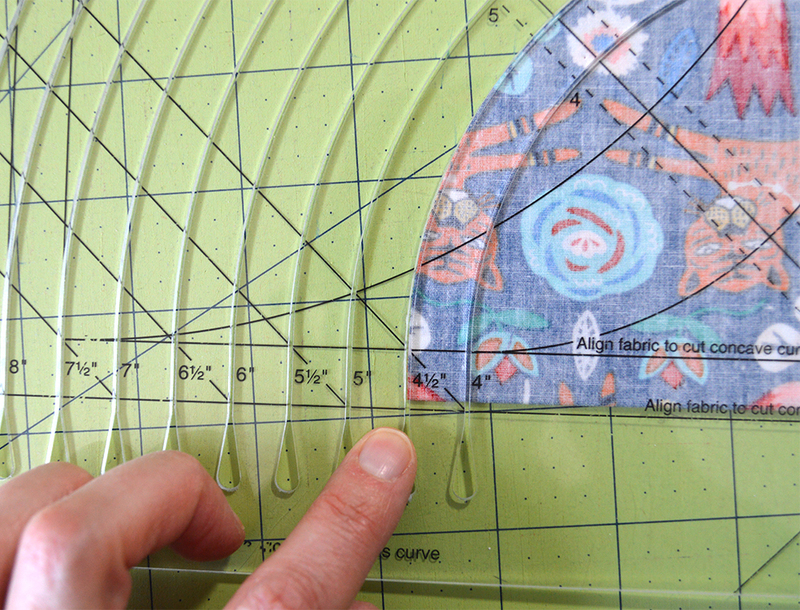 Now slide the Ruler so that your fabric is a scant 1/8″ inside the convex shape lines. Cut the curve with the 4 1/2″ groove. 6. Place the folded background and the circle fabrics on the pressing board. 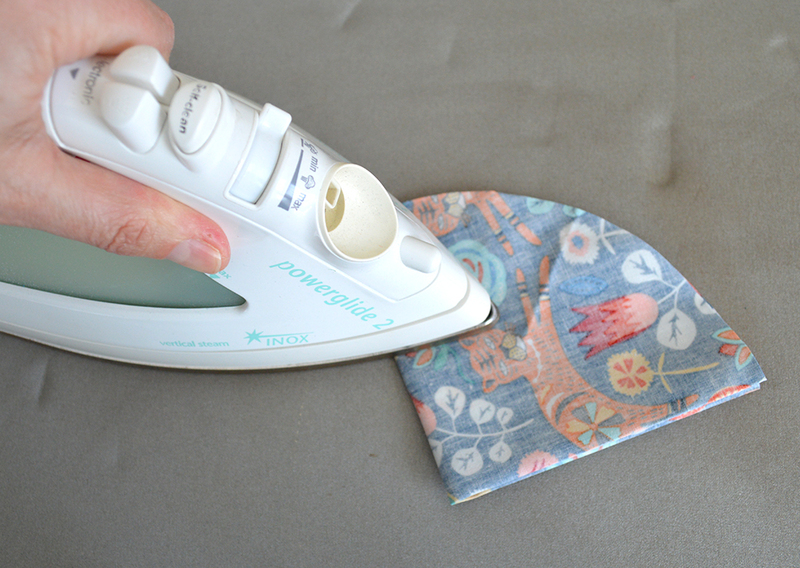 Use your iron to press the fabrics to leave creases at each fold. This gives you a marking at each point 1/4 of the way around the circle. 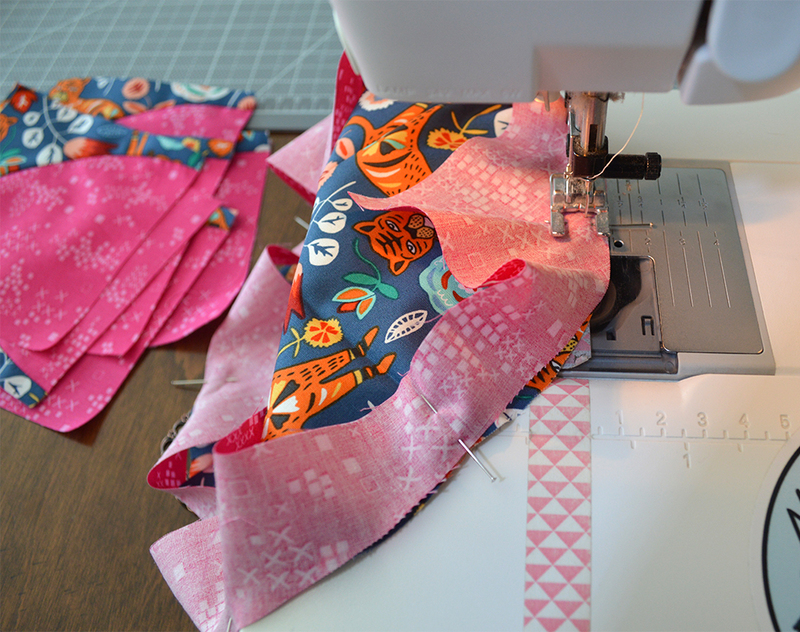 Open and fold the fabrics again so that you can mark the points half way between each of the creases marked in step 6. 7. Place the circle fabric on the work surface face up. Place the background fabric face up so that the hole is over the circle fabric. Turn the background fabric right sides facing the circle fabric and match up the fabrics at the creases. Pin at each crease. 8. 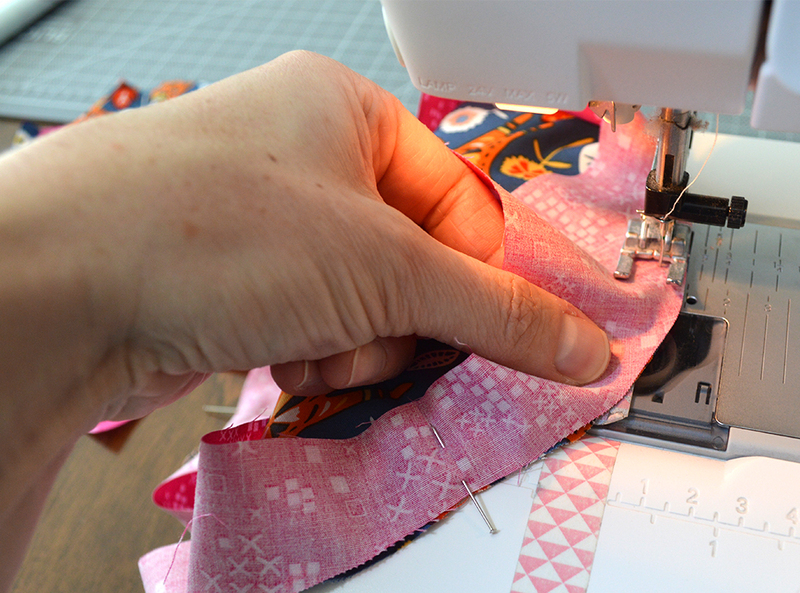 Place your fabric under the presser foot near one of the pins. Set your machine to needle down if you have that feature. Sew slowly and remove pins as you approach them. As I am sewing, I use my right hand to guide the fabric to the needle and I hold the top fabric between thumb and forefinger of my left hand. The right hand is keeping the whole thing moving evenly while the left hand is making sure the edges of the fabric stay aligned as I sew and also keeps the top fabric feeding straight and evenly with the bottom fabric. Once you have finished sewing all the way around the circle. 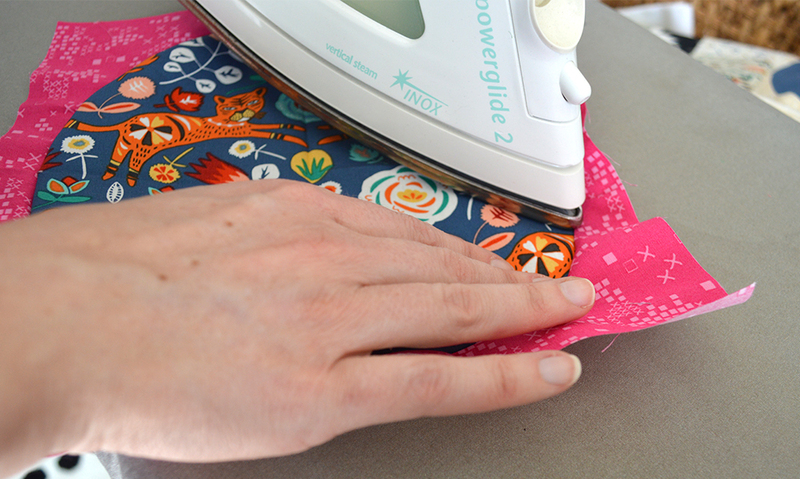 Carefully smooth the circle fabric on your pressing board and use the tip of your iron to press the background fabric away from the center. Don’t rush this part, you don’t want to distort the fabrics and you want to make sure your seam is pressed down nice and smoothly. it’s finished! don’t worry if the edges are a bit wonky, that kind of comes with curved piecing and making those fabrics go in ways they may not want to. Trim and straighten your edges to make your block square again. I trimmed mine so that there is about 5/8″ of background fabric on all four sides where it’s closest to the circle. I can’t wait to show you this finished quilt! 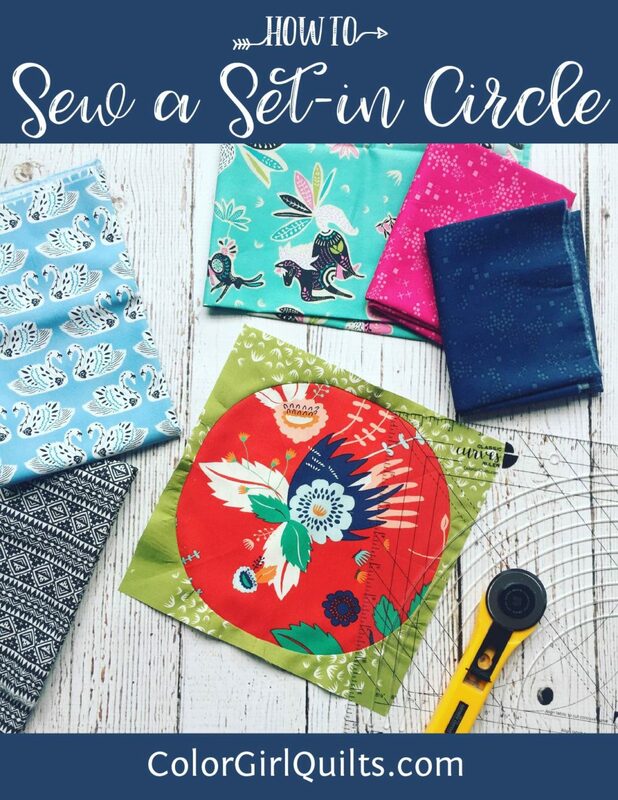 Do you have a large scale print you are ready to sew into big circles? I think a whole quilt of these would be really graphic and such a great way to show off those prints. Don’t forget, to sign up to get email from me! So cool! I’m anxious to try this! Thank you. Hi Sharon! In dressmaking I was always told to sew “with a relaxed bottom”. I guess that works for circular quilts too! I did not know it could be done! Timely, as my local guild’s 2018 challenge is…circles.